This month I'm delighted to feature this species and an article from Shane Linder. He introduces a common catfish that most of us know from one of his most collected, favoured and studied of genera. After decades in the hobby, and having earned half a dozen common names and two L Numbers, the most commonly imported Chaetostoma finally received a scientific name in late 2011. For many of us that had spent years trying to explain that it was not Chaetostoma thomsoni, as it was commonly misidentified in dozens of resources, it was a great relief. Chaetostoma formosae is exported from near Villavicencio, Colombia in huge numbers. In the dry season especially (November through January) it can be found in almost any fish retailer quite easily. Even the U.S. mega chain stores, which are heavily focused on farmed fish from Florida, carry them. Any hobbyist with a discerning eye will also note that every shipment of "bulldog plecos" contains not only C. formosae, but its white-spotted cousin C. dorsale. Ideally Chaetostoma should be maintained in a species tank. This is in part because they need conditions that not many other tropical fishes will appreciate. It is also because they are secretive, and sometimes downright difficult, to get feeding regularly. They can of course be easily combined with other hillstream loricariids that need a similar captive habitat and diet. While I have not tried it myself, I suspect they would do quite well in a tank that also housed hillstream loaches. 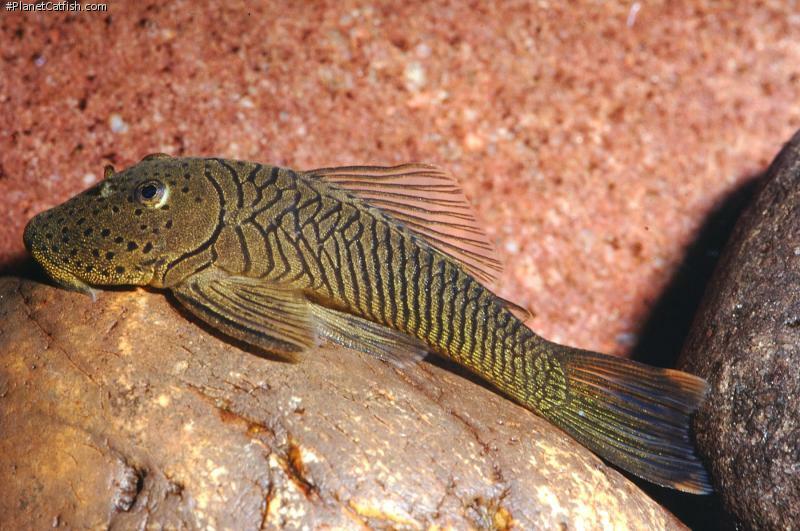 Chaetostoma are found in piedmont or hillstream environments (known as a quebrada in Spanish) all along the Andean mountain chain. I have done extensive collecting of Chaetostoma in piedmont streams in Ecuador, Colombia, and Venezuela and while the species of Chaetostoma change from stream to stream, the environment is always very similar. Due to their gradient, the water is always moving at a good pace, is very clean, rich in oxygen, and typically quite clear (they can become turbid during the wet season). The water's pH is near neutral, or even slightly alkaline, and low in hardness since these streams are fed by snow melt and rain falling higher in the mountains. Their source waters, and the altitudes they are found at ensure that hillstreams remain cool by tropical standards. Dependent on several factors, the water can range in temperature from the low 60s to the upper 70s. The substrate consists of well-rounded stones and course gravel. The stream's current, especially in the wet season, washes light weight materials, like fine sand and driftwood, downstream. Aquatic plants are never found in these environments. The above conditions can easily be replicated in an aquarium. Provide clean, neutral water with good oxygen levels. It is not necessary to replicate the strong current found in hillstreams for these fish to be happy, but many hobbyists use powerheads and or streamers to keep oxygen levels and these have the added bonus of replicating a natural current. For C. formosae a temperature in the low to mid 70s is ideal. It is important to note that these fish can not tolerate poor water conditions as, even in the dry season, the streams they live in remain clean and because they are continually refreshed with run off from the mountains. The single "hard" thing about these fish can be getting them to accept aquarium foods. For reasons I have never understood some will eat with no problem and others will starve themselves to death even when offered a variety of foods. As they consume many small organisms while grazing along the stones in their natural habitat, their captive diet should consist of both fresh vegetables and more meaty type foods. Some lucky aquarists get theirs to feed even on dry foods. I have had good luck keeping vegetables always available and feeding a frozen meaty food every third day. C. formosae has been spawned a few times in the aquarium, but in all the cases I am aware of it was "accidental" (for the aquarist anyway). Two specific spawnings I am familiar with occurred when the tank's temp was raised to 78°F for one reason or another. Given their natural habitat it makes sense that a warming of the water might signal the beginning of the dry season and initiate spawning behavior. Spawnings always take place under a stone or similar flat object often near, but not directly in, the current. Chaetostoma ignore the spawning tubes that are necessary to spawn many other loricariids. Their preference is to hollow out a cave-like structure under a stone. In every spawning the group of fish had taken to accepting dry aquarium foods. The fry have proven extremely difficult to raise in all cases. The author's current C. formosae species tank. He swears there are eight of them in there. Etymology Greek, chaite = hair + Greek, stoma = mouth. This species is named formosae, an adjective in genitive case derived from the latin formosa. The name honours Ballen's sister, Laura María Ballen, in recognition of her unconditional love and support to him. Size 103mm or 4.1" SL. Find near, nearer or same sized spp. This particular species has spots only on the head. All fins are clear and each body armour plate is lined in black. The basic colouration is pale olive green. Aqualog shows this fish as L146/L146a and L187b. The real L146 (introduced in DATZ) is a rather unusually shaped but plainly coloured ancistrine loricariid also from Colombia. L187b is an Aqualog invention and only used here for reference/link back to the old Aqualog literature. Variously and incorrectly labelled as C. thomsoni and others. Some sources consider L444 the same as C. tachiraense. This may stem from a confusion about the Rio Tachira in the Rio Meta drainage, and the namesake river in the Maracaibo basin. Sexing The males have however a somewhat larger and broader head, slimmer ventral sides and disproportionately large pelvic fins. Perhaps the over-sized pelvic fins play a large role in the fertilization of the eggs. By inverting these over the clutch of eggs, they prevent the sperm cells being carried away too fast in the current. Distribution Currently known from western piedmont tributaries of the upper río Meta and Guaviare basins, in departments of Meta and Casanare, Eastern Colombia, Orinoco drainage. Other Parameters Has more stringent demands on water quality than many plecos and requires highly oxygenated water when kept in warmer water. Medium hard water is also beneficial. There are 125 registered keepers, view all "my cats" data.